While the beginnings of communism can technically be seen thousands of years earlier, it isn’t until Karl Marx began a more modern form in the 1840’s that the idea of communism began to increase in popularity. Marxism gained support across much of Europe and lead to the creation of the Soviet Union in the early 20th century. The rise of communism subsequently had an enormous impact on the rest of the world. The Soviet Union’s creation in 1922 created a network of communist states, known as the Soviet’s Eastern Bloc, and eventually engaged in the Cold War in 1945. Major parts of the world, including countries of eastern Europe, Asia, and pieces of Africa, were taken over by the Communist name. Third world economies were especially subject to this political regime due to social unrest and calls for economic change, the “utopian” idea of Communism had great appeal to lower class citizens wishing to spread the world’s wealth. The fall of the Communist regime began in 1989 with the countries of Poland, Hungary, Bulgaria, Czechoslovakia, Romania, and the Eastern half of Germany. Revolutions to overthrow oppressive communist rule developed through resistance of one-party rule. While these swept large areas in Europe and Russia, China failed to participate in any major political changes right away. The images of protest spread, however, and these sparked events across the globe. The fall of the Berlin Wall, the Collapse of the Soviet Union, and the end of the Cold War at the Malta Summit followed, officially generating a political shift away from communist governments. European politics were affected dramatically; many post-communist countries joined the North Atlantic Treaty Organization (NATO), adding strength to their social and economic sceneries. The effects of this collapse hugely impacted Western foreign policies. Defense budgets were dramatically downsized as peace-seeking, liberal-leaning governments took over and America ultimately became the world’s largest superpower. Countries backed by the USSR, like many areas in the Middle East, lessened their aggressive nature and lead to peace treaty signings between Israel and Egypt as well as a decline in anti-Semitic terrorism. The collapse also highlighted major faults within the system of communism, proving that its political foundation goes against human nature. This lessened imposing threats such as China, that were still practicing Communist ideals, since they were now associated with these weaknesses and seen as politically flawed. The West, specifically America, was able to shift from being one of two world superpowers to the world’s superpower at this period in time. A sequence of revolutions taking place in Russia during the year 1917 became known, collectively, as The Russian Revolution. In a successful effort to destroy the Tsarist autocracy that was taking place in Russia at the time, the people of Russia replaced their old government with a provisional government and eventually the Communist party in October of 1917. This made way for Soviet Russia to take hold, which was lead by socialists, thus gaining popularity among the massive amounts of lower-class citizens present in Russia. 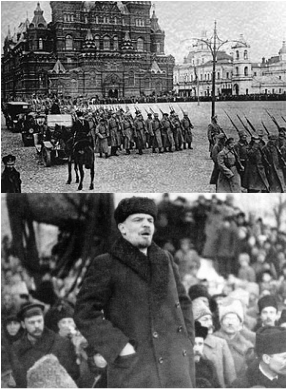 Vladimir Lenin, the head of the Bolshevik (communist) party, declared leardership over various government ministries and seized control of the Russian countryside. A revolutionary wave, taking place until 1923, shortly ensued. This included Marxist movements to take place in Germany, The German Revolution of 1918-1919 as well as a Hungarian Soviet Republic to take place. Globally, the effects of this revolution were immense, showcasing an example of how the rise of communism affected the world on a global scale. It not only encouraged the initial spread of communism in Russia, but the entire world. The third international formed, which greatly increased global tensions due to the now division of the world’s countries into two; communist nations and capitalist nations. Imperialism took a heavy decline in popularity as freedom, expressly liberal, movements took a strong hold over the world’s people.